I've always imagined being able to tell my kids stories of sports greatness, how I was able to witness history in the making. I could probably tell the Baby the glory days of the Triplets and how they dominated the NFL. I could tell her how Sunday was my favorite day and my dad would tell me and my brother to watch the Cowboys play so we could learn how to be better football players. I could tell her how the Dallas Mavericks were one game away from winning it all or how the Cowboys are the favorites to win every single year but seem to come up short. But this year was different. This year it was the Rangers' time. Now I will be honest, I'm not the biggest baseball, not in the least. I've been to a few games before, I would even bring my glove thinking I would catch a foul ball but then I found out only 8 year old boys bring their gloves to baseball games. The adults bring their beer drinking hands. I wouldn't take the time out to find out when the next baseball game was and I definitely didn't take the time to watch a game from the first pitch to the last out. Personally, I just never saw baseball as a team sport. The pitcher does his own thing on the mound and each batter has to hit the ball. It's not like football where the line must block and the receiver has to run a precise route. But this year I decided to get a different perspective of America's Pasttime. Nolan Ryan was running the team and the sale of the team was imminent. The experts predicted that the Rangers would have their beat season yet, winning at least 80 games. So I am sure it baffled the experts when the Rangers were the clear cut team to win the AL West almost by midseason. It was just a great season and the Baby was able to experience her first baseball game after being just weeks old. 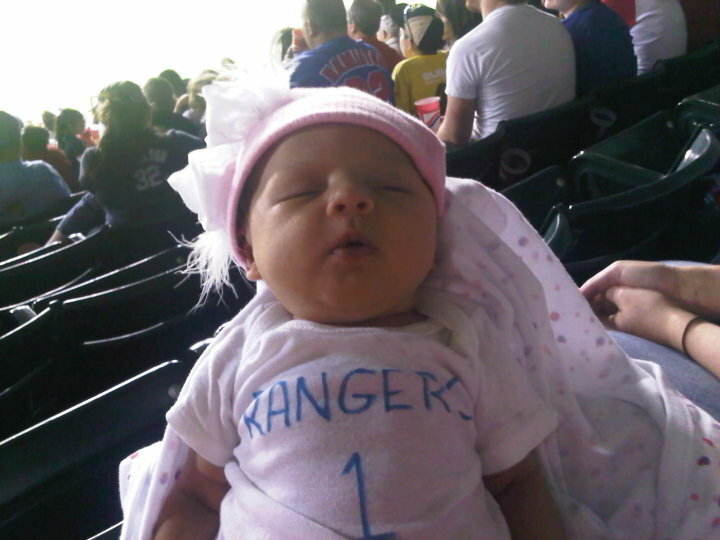 The Rangers won that game and as we were leaving the Ballpark, someone said "she must be a good luck charm to see a win at her very first game." The Baby didn't even cry when the fireworks busted over head. Maybe she knew we were in for a full season of them. I get to tell her first hand about the drama that unfolded when the team was for sale. I could tell her about the trade rumors and different scenarios on how the Rangers need that "missing " piece. I can tell her about how we got one of the best pitchers in baseball when he had already packed his bags for the Big Apple. Or I could talk about the player nobody wanted but who would end up being the comeback player of the year. Or the "Natural" proving to everyone that he was finally back. I could delightfully tell her the story of when her mother and I were trying to clean up the house and I would take mini breaks to catch an improbable comeback when a "fat kid who can't run good" belted a three run homer to left field to stun the crowd and sending them for the exits. And I am glad I have something to tell the Baby that something great happened the first year she was growing up. Claws and Antlers.